Running a business is not easy. Running a business and trying to manage a successful social media platform at the same time? Talk about having your hands full. All those times when a brand has either slipped up or somehow missed their target by a mile, those times are likely the result of not having effective enough marketing goals in place. Are mistakes inevitable? Sometimes. Are they avoidable? ABSOLUTELY. One of the biggest challenges faced by business users of Facebook and other social media platforms who are using these as marketing tools are getting their followers to become paying customers. Believe it or not, there was once a time when Facebook actually disapproved of advertising on the platform. It was in 2013 when a change was slowly starting to happen. First time setting up a business page? Then you’ve found the perfect book for you. The goal for any business is to achieve success with their marketing campaigns. No matter where these marketing campaigns may be. This advanced manual is going to guide you through the most effective marketing advertising tips and tactics to help you optimize your Facebook business profile for success. A strategy is your most winning arsenal against social media warfare, and once you’re done with this manual, you will be well on your way to Facebook marketing success. This book focuses on real-world examples of what makes an effective ad. By the final chapter, I'm comfortable not just in making my own ads, but competing against other businesses on Facebook! It's informative guide for Facebook Marketing. The author explains the book very excellent step-by-step and it is very easy to understand. Not only are those billions of people connected on this social media platform, but they log in multiple times in a day just to either check what’s happening or to post an update themselves. For a business, that’s almost a billion people a day, multiple times a day who could potentially see your product or service. With features such as page insights, content management, page and ad management, content curation and more, Facebook is a social media marketing goldmine for businesses. 4.0 out of 5 starsUseful guide book to learn new things on facebook! What a great resource full of valuable information and i like having the information neatly cataloged in one place in a step-by-step format, so I don't mind at all paying for this book and i now have all the information I need to begin my campaigns and if I should get out of my depth, at least I know who to hire to help me out and there is nothing wrong with self-promotion provided that the accompanying content is valid and it contains a lot of invaluable information pertaining to how to market yourself through Facebook and in the book, you'll learn to understand how the average Facebook user thinks. Hint, and i’s a LOT different than you think and author teaches you how to create an ad that will catch the eye, keep your target interested, and why it's so important to do it in a specific way. 4.0 out of 5 starsEasy to understand...thank goodness! The book for review is ''Facebook Marketing '' By Mark Gray. If you own a business and want to advertise on Facebook this is a must-read for you. 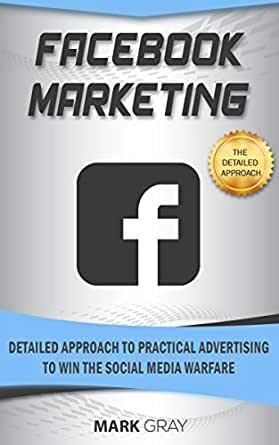 Even if you end up hiring someone to do your Facebook advertising just reading this book will let you understand what they have to go through to give you the kind of reach and engagement you are hoping for on Facebook. Andrea definitely demystified Facebook Marketing in this book. The book is full of links and screenshots showing exactly what to do. It gives step-by-step instructions for setting up a business account and launching an ad campaign on Facebook. In extensive detail, it covers everything from Facebook's ad policies to different types of ads to best practices for designing a sales funnel. Facebook ads are especially great for small businesses and start-ups because they're relatively inexpensive and can be targeted at very specific demographics. Highly recommend this book for anyone looking to make money online in 2019.